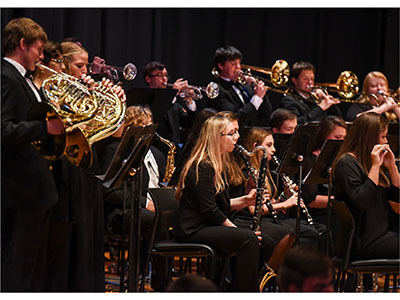 “Going Global: Around the World in 90 Minutes” is a performance that ETSU’s Concert Band and Wind Ensemble will be putting on Tuesday, March 1, from 7:30 p.m. – 9:30 p.m. in the D.P. Culp University Center Auditorium. Admission will be free, though, donations are always accepted. This performance will include the concert band performing five different selections and the wind ensemble performing four selections. These selections include Darius Milhaud’s Suite Francaise, Dmitri Shostakovich’s Festive Overture, British Eighth March by Zo Elliot, Windows of the World by Peter Graham, Australian Up-Country and Irish Tune by Percy Grainger and more. In total, around 80 musicians are expected to be performing for the public at this event.